A while ago, to celebrate our new look, we hosted a really fun giveaway for all our readers. One lucky bride was going to walk away with her wedding stationery specially designed by us *for free* which included a save the date, wedding invitation, ceremony program, menu and seating plan design. We were thrilled when Xanthe, our winner, first described the look and feel for her wedding. 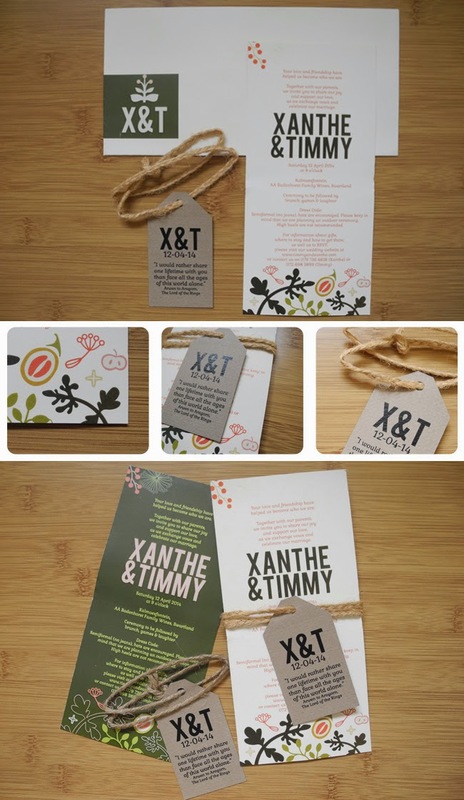 Xanthe and Timmy are tying the knot this Saturday in a day wedding held in Cape Town. Their theme is all about bold, earthy palettes and rustic, natural textures that speak to the Fynbos surroundings of Cape Town that we all know and love. Dark moss green with splashes of yellow and coral complimented a rustic twine rope that held a kraft and black luggage tag. The look was completed with matching envelopes and a wrap around, personalised envelope sticker. We had originally also proposed a dark moss green coloured invite which we just had to show you too! Which is your favourite?